I started running out of shampoo and conditioner at home last week, so I took a trip to my local Target to see what natural hair products I can use on my natural African American Hair. I was on a budget, so I couldn't spend over $10 a product that I normally do with the products Target has in the natural black hair section. While browsing, I came across L'Oreal EverStrong Hydrate Sulfate-Free Shampoo and their Conditioner. On the bottle it says that it's 100% sulfate-free with natural botanical and no harsh salts, 100% vegan, Bio-ceramide complex (which strengths the hair). For the price $5.99 each a bottle of both shampoo and conditioner, I had to give them a try and see how well it'll work on my hair. Also I'm already a product tester for L'Oreal and wanted to test their shampoo and conditioner products since I haven't already. During my hair washing day, I wash my hair with L'Oreal's shampoo first. The shampoo has a bit of a minty smell to it. Doesn't smell bad at all but rather good. Also the texture of the shampoo is like a white cream that lathers up very well. After washing with the shampoo my hair had a very clean feel to it. After using the shampoo, I'd used the conditioner and left it on my hair for about 5 to 10 minutes. The conditioner has the same minty type smell to it and had a somewhat of a thick texture, also it left a bit of a tingling feeling in my scalp. Once I washed the conditioner out my hair, my hair was so stiff and tangled! I like to have my conditioners add slippage to my hair and help my hair be more easily comb-able since my hair is very curly. So I wasn't that impress with the conditioner. For better results, both the packages on the shampoo and conditioner say to use their replenishing masque for more added strengthening but I didn't buy it, maybe next time. I did do a deep conditioning with another brand, blow dry, and flat iron my hair, and I noticed a huge difference in the strength of my hair. My hair felt healthier, stronger, shinier, and fuller! 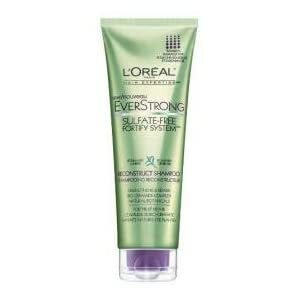 I'm happy that I've bought L'Oreal EverStrong Hydrate Shampoo and Conditioner! Aqua/Water/Eau, Cetearyl Alcohol, Glycerin, Behentrimonium Chloride, Cetyl Esters, Isopropyl Myristate, Quaternium-80, Polysorbate 20, Parfum/Fragrance, Methylparaben, Polyquaternium-37, Paraffinum Liquidum/Mineral Oil/Huile Minerale, Mentha Piperita (Peppermint) Leaf Extract, Tocopherol, Limonene, Chlorhexidine Dihydrochloride, PPG-1 Trideceth-6, Linalool, Rosmarinus Officinalis Oil/Rosemary Leaf Oil, Butylphenyl Methylpropional, Citronellol, 2-Oleamido-1,3-Octadecanediol. 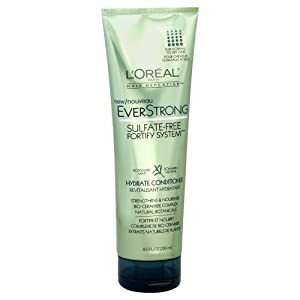 Is L'Oreal EverStrong Hydrate Shampoo and Conditioner Worth a Try? I'm very impress with the shampoo and glad I've used it. I'm adding the shampoo to my "Like" list of shampoos. Now for the conditioner, I don't like how my hair was stiff and tangled after using it which made my hair harder to comb. I'm still going to give the conditioner a second chance. Maybe it's just that way with my own hair and it may work better with a different texture of hair. So if you're on a budget and looking for some shampoo and conditioner without the harsh chemicals, you should give these products a try. Wow really nice information. Here you can find some free samples of shampoo in many brands. Thanks Adela! I'll check it out!